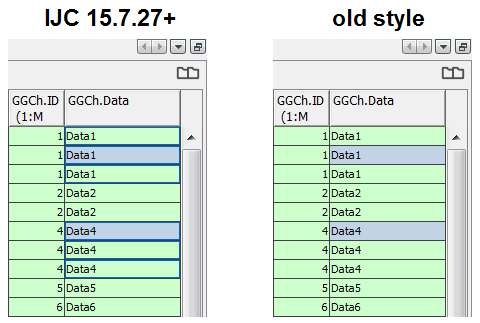 Multi-edit fu nction has been introduced in Instant JChem 15.7.27. It enables editing of multiple rows at once, which might be very useful both in grid views and table widgets. This feature works even in a multi-entity environment connected by many-to-one or one-to-one relationships. In relational data models it can often be hard to keep track of which data are edited. The Multi-edit fun ction makes the task easier by highlighting the cells that will be edited together with the currently selected cell. The functions are most easily demonstrated in a gridview of a multi-entity environment bound in a many-to-one and one-to-one relationship. 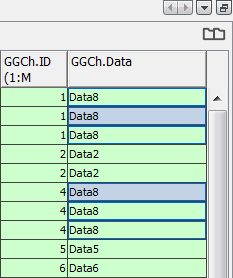 When selecting more than one row, such as Data1 and Data4 in one entity, the selected cells are highlighted in grey. Additionally, all the cells linked to the same row(s) as the currently selected cells are highlighted by a blue border, as you can notice below. 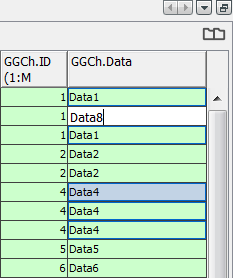 In addition to the two selected cells, four more cells also containing Data1 and Data4 are highlighted. Editing of multiple rows is performed using right-click menu Edit value option or the F2 shortcut. Double-clicking will edit only the cell being clicked on, as it de-selects other cells before editing. A warning window appears when you are trying to edit multiple rows in a data entity. If you select OK in the warning dialog, you are able to change the value in one of the selected cells. After confirming, you can notice all the selected cells have been updated to a new value.